How do I modify the Hunt Group Profile? How do I configure Hunt Group settings and assign users? How do I assign Call Distribution policies? How do I configure Call Forwarding settings? How to I configure Business Continuity and Busy settings? To learn how to assign Lead Numbers, please visit the Lead Numbers Article. A. What is a Hunt Group? Hunt Groups are used to ring specific groups of Users in a pre-determined pattern within or across locations when a call is made to the Hunt Group telephone number. B. How do I modify the Hunt Group Profile? Click Hunt Group on the menu on the left. Hunt Groups that have been assigned to your account will be listed. By default, the Hunt Group Name Field will be populated with the Hunt Group phone number. This is the phone number that callers can dial to reach the Hunt Group. This is also known as the Lead Number. Lead Numbers are assigned during the provisioning process and are determined by working with the Site Administrator. Click on the Hunt Group you want to modify. Click Edit. The Edit Hunt Group pop-up appears. C. How do I configure Hunt Group settings and assign Users? 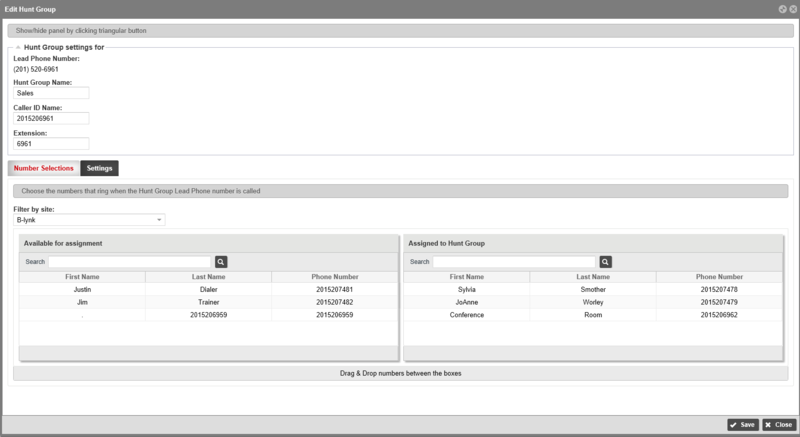 By default, the phone number assigned to the hunt group is displayed in the Hunt Group Name field. You can change the name to something more descriptive. For example, it could represent a description of the users that assigned to the group; e.g., Sales, Customer Service, etc. Note: The Lead Number assigned to this Hunt Group is displayed as a read-only number. The System Label, which is made up of the Caller ID Name and the name of the caller, will be presented to a User when receiving a call from the Hunt Group. For example, if the Caller ID Name is modified to “Sales” and “John Smith” is the caller, the label would appear as “Sales – John Smith”. Note: There are no restrictions on the length of your Caller ID Name, but because of some Caller ID space limitations, it’s best to keep it relatively short. Modify the Extension assigned to the group, if applicable. By default, the extension is populated with the last four digits of the Lead Number. Click the Number Selections tab to assign users to the Hunt Group. Select a site if you want to filter by site, if applicable. Click and drag the user from the Available for assignment section to the Assigned to Hunt Group section. Note: Drag and drop within the Assigned to Hunt Group section to change the order of assigned users. The order the users are listed is important if the Call Distribution Policy is configured to Ring in the Order of the Selected Number or Ring in a Circular Sequence. D. How do I assign the Call Distribution policy? Click the Settings tab to configure call distribution. 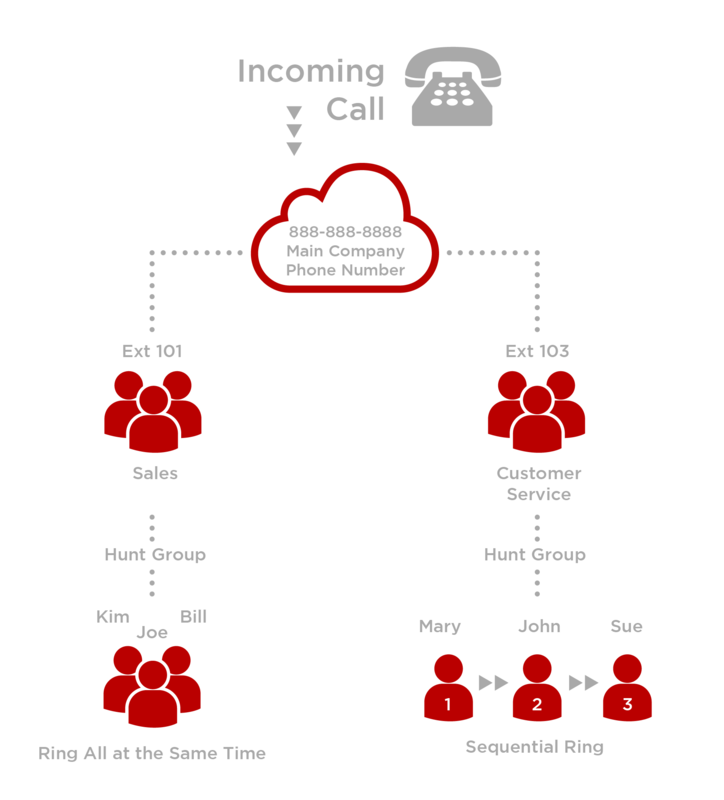 Call Distribution Policies define ring patterns establishing the order in which calls are delivered to the Users in the Hunt Group. All at the Same Time – ring all users’ phones at the same time. One at a Time – ring all users’ phones at the same time. If you select this option, select how you want the calls distributed. 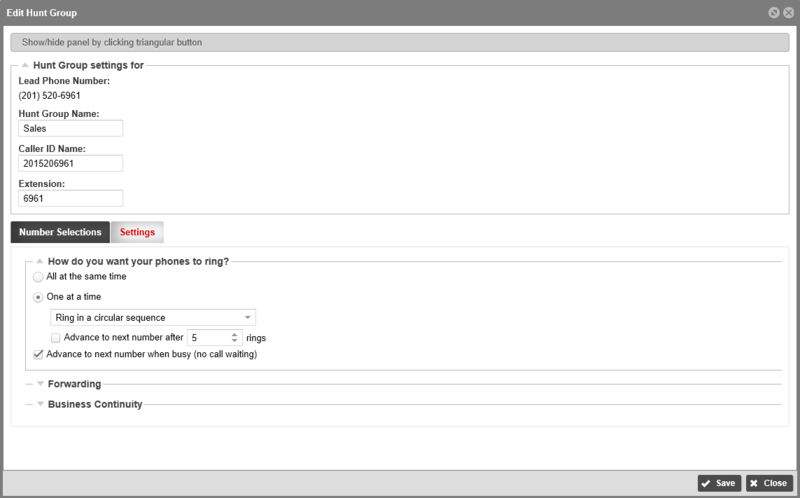 Distribute calls evenly among phones – Ring the user who has been idle (i.e., not on a hunt group call) the longest. Ring in a circular sequence – Ring the users one-at-a-time, always ringing the users in the same order. The order of the Users in the “Assigned to Hunt Group” list represents the order in which the Users’ phones will ring, beginning with the individual that follows the last User receiving a Hunt Group call. Ring in the order of the Selected Number – Ring the users one-at-a-time, always starting with the same user and ringing in the same order. The user configured at the top of the “Assigned to Hunt Group” list will ring first, followed by the users listed beneath, in sequential order. Weighted Distribution of calls among phones – Route calls to users based on their pre-configured weight (percentage) assignments. If this option is selected, you must assign weights to the users. Click Set Weighted Percentages. Use the slider to assign the percentages. The percentages must equal 100%. Users assigned a 0% weight will only receive calls if all other users are busy. Check Advance to next number after ___ rings and enter the number of rings. Calls will forward if no one answers after a set number of rings. This represents number of rings per user. Check Advance to next number when busy (no call waiting). Calls will forward if the line is busy. Uncheck the box if you prefer that Hunt Group Users on calls see additional incoming Hunt Group calls via Caller ID and are able to answer them while already on active Hunt Group calls. E. How do I configure Call forwarding settings? Hunt Group Forwarding settings are used to forward calls if none of the Hunt Group members is available to answer an incoming call. Click the arrow to expand the settings. Check If no answer after X rings to enable forwarding if no one answers. If forwarding is enabled, enter the number of rings before forwarding. This is the total number of rings for all hunt group users. 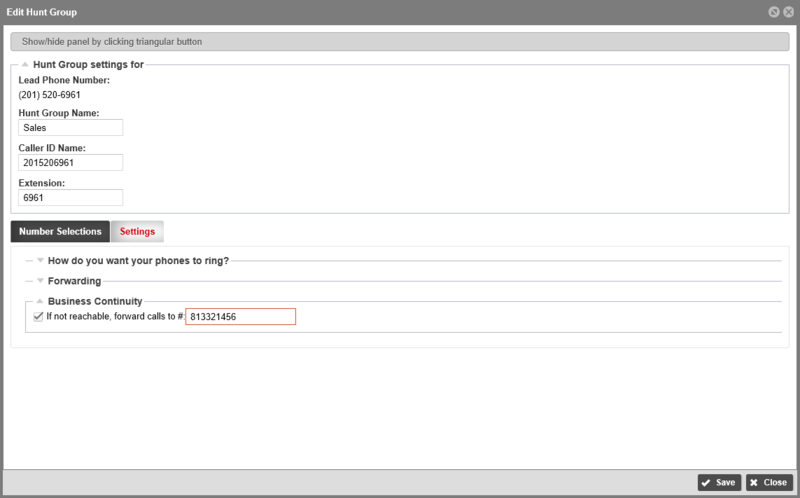 Select where you want calls forwarded: Internal, External, Extension, or Send to voice mail. Internal Number – select the internal number from the drop-down list. External Number – enter the phone number. Extension – enter the extension. F. How do I configure Business Continuity Settings and busy settings? Hunt Group Business Continuity settings are used to forward calls if Users within the Hunt Group cannot be reached. For example, if your office loses network connectivity, Business Continuity settings will be activated. A Hunt Group is busy when all Users in the Hunt Group are on a call and there is no call waiting. If Call Waiting is enabled and every User has four active calls, that Hunt Group is busy. Check If not reachable, forward calls to # and enter a number you want calls forwarded if users in the Hunt Group are not reachable (e.g., phone not connected to network) or the Hunt Group is busy.